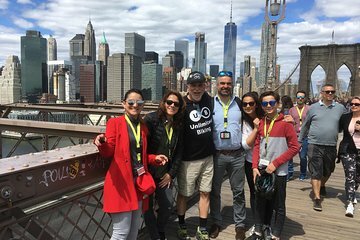 Découvrez le meilleur de Lower Manhattan lors de cette visite guidée à vélo du pont de Brooklyn qui couvre tous les points forts. Naviguez dans la ville sur deux roues et explorez les rues en vous dirigeant de la pointe sud de Manhattan à l'hôtel de ville et au célèbre pont de Brooklyn. Cette ascension facile mène à des vues incroyables et à des séances de photo de choix. Assurez-vous donc d'apporter votre appareil photo! The tour said it was good for children. I brought my 15 and 9 year old. They had a bike that fit them each well. However, with one guide leading 15 people, it was scary having my children ride the streets of NY with all the traffic and not enough structure to navigate the traffic lights. Our group did not have enough time cross an intersection before opposite traffic would beging to move. My 9 yo almost got hit by car if it wasn't for me screaming for her to stop. Very hairy. Great trip with amazing views of the city! Excellent knowledgeable guide with good safety sense amidst NY traffic. Stan was amazing! Super knowledgeable and hilarious! Would do it again in a heartbeat!